Picking art for my home was something I put off for many years. It seemed so adult to select and hang art in my home. Let’s be honest – I’m still shocked a mortgage company trusts me to even own a home. So while my mind feels 22, my body doesn’t show it – so I’m here trying to catch up on adulting. Adding art to my home seemed a bit daunting, so I did some research and grabbed a great piece on Minted. I thought some of you might be in a similar spot in life so I’m sharing my tips for how I narrowed down my selection. Today’s post is in collaboration with Minted. If you aren’t familiar with Minted, it’s a website where independent artists can submit their artwork for the chance to be selected to be sold on Minted.com. All of their designs sourced from their global community of independent artists span beyond wall art into stationery and home décor, as well. And here you can see the space now! It could really only go up from where it had been :). I wanted to use a good chunk of negative space on the wall without overpowering the console table so I opted for the 18″X24″ Sandy San Franciscan Steps piece by Sharon Rowan. There are lots of matting and framing options to choose from. Since I like to keep my home light and bright, I went for a white matte and frame. I was pleasantly surprised by how many pretty frames you could choose from. I opted for cottage white but I also loved the herringbone white and whitewashed farmhouse options as well. Styled by Caroline J. you can shop this look here. Do you have a bare wall you want to decorate? Perhaps above your living room sofa or for me in a small, high trafficked hallway between my living room and kitchen. The first thing you’ll want to do is find the location where you want to fill the space. The art in your bathroom will be much different than the art in your living room. You probably want something more serene above your bathtub while you might want something more playful in your kitchen. So picking a location is my first tip to deciding what art to choose. After deciding on the location, look around. Consider not only the size of the wall but the size of the room in general. 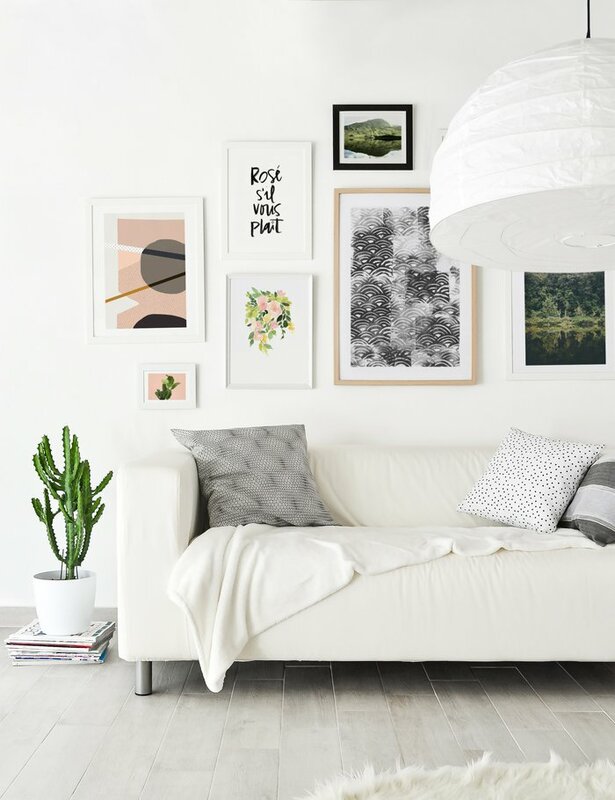 If you have a large living room with high ceilings you may feel like you want a gallery wall so you’re not left with too much negative space hanging just one piece of art. One of the bigger mistakes I’ve made with art is buying pieces that are too small for the space. I read a suggestion that the art above your living room sofa should take up 2/3 the length of your furniture. Lucky for you Minted carries really large pieces to fill such large spaces :). Aside from the size of the area, you’ll want to tie in your existing decor. To keep things cohesive consider labeling your style. Is your living room modern glam, farmhouse, or something else? This will help you recognize the difference between a piece of art you love, and a piece that you love AND belongs in your home. I love coastal decor so when I search Pinterest I often include “coastal” in my search term. Once you’ve decided where you want to hang art and how big you want it – find some inspiration online. I find Pinterest is the best place to go for interior design inspiration. Again, this will help you narrow down your options. Do you prefer a wall with lots of art/decor or one big impact piece? Make a board specifically for art inspiration so you can reference it and find similarities amongst the spaces you love. Many people grab art when they travel to remind them of fun adventures, while others prefer art that’s more abstract or even framing a quote. You can certainly mix a few of these if you want a gallery wall, but choose a common focus. Do you love animals, travel, or perhaps landscape photography? You want to see the art and let it speak to you – over and over again each day! At the end of the day art is something you can take with you if you move, so let it be something you love. Since I love the beach I naturally went for art work that reminded me of my happy place! If you aren’t sure about hanging art on your walls you can also opt for an art shelf. This allows you to mix and match art and decor you love and swap things out without putting additional holes in your walls. I particularly love the art shelves Minted displays with the cutest nursery art in their kids section. If you still feel lost you can actually TEXT a photo of your wall to Minted at 415-993-WALL(9255) and they will help you style it! Could that be any easier? Professional design advice for free! I hope you found these tips for choosing art to be helpful! If you or someone you know is expecting I wish I knew about the nursery art on Minted when I was pregnant. I appreciate you stopping by! Stay tuned on Instagram stories as I’ll be sharing more updates as our home renovation winds down. If you’re interested in the other decor from this post let me know and I can do a post about that as well. Thank you to Minted for sponsoring this post. All opinions are my own, I appreciate you supporting sponsors of Pinteresting Plans. Such great tips! I feel out of my element choosing art — kind of like choosing a fancy wine. I just want a good one, people. I think if you go with what you love, you can’t go wrong — great advice! It should be about you! I will definitely check out Minted! Thank you Carissa!!! I am the same way with wine. HAAA!